If you looked up the definition of a 'daredevil' in the dictionary, you'd find the perfect description of me. Although you'd have to look under the antonyms part because I'm basically the biggest chicken alive. Or dead. Or poached slowly in white wine. Adventure is not my middle name. I'm not even quite sure how to spell it. If there are adrenaline-junkies, then I'm a serenity-addict. My ideal day at a waterslide park involves me finding a sunlounger and a good book while my husband takes our kids on the rides. The most activity I'll do is turning the pages of my novel and lifting my head to sip from my mojito. Having the title of 'family chicken' comes with quite a bit of, ahem, roasting from my kids. "Hey Mum, are you coming down the Twisted Viper with us?" they'll ask on a day out. Cue hysterical laughter, knowing that there's a greater chance of Kim Jung-Un making daisy chains with Donald Trump than me getting on any rides that raises my heart rate above 70 beats a minute. My fears basically come from my firm-held belief that even the safest ride will completely malfunction if I go on it and I will meet my maker - not the best way to end a family outing. The very few times I have given a scary ride a go (a particularly terrifying rollercoaster in Las Vegas still makes me shudder), I spend the whole time wishing for it to be over and making promises with God (sorry I haven't kept them, Big Guy). I know my anxiety around these rides is mostly irrational, but every now and then there will be a tragic fairground disaster and it will only confirm my fears - and make them worse. 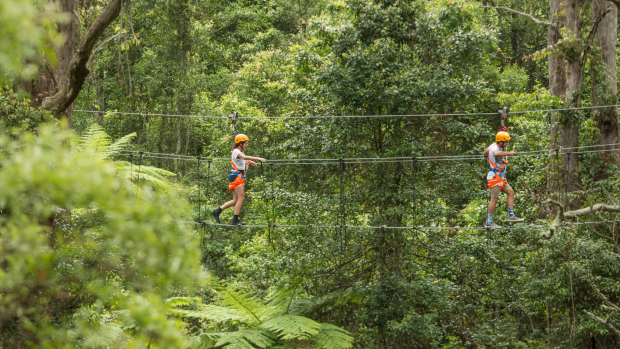 So when I was recently invited to attend the highest zipline tour in Australia at Illawarra Fly Treetop Adventures, my first reaction was to respond with a polite, "No thanks." It will come as no surprise that the thought of careering through the trees at 35 metres above the ground just doesn't appeal to me. But I knew this was an adventure my kids and husband would love. Really love. So my other option was to say "Yes" and prepare for a day where I'd sit in the cafe for hours while they had what they call 'fun'. Then I thought about it - was this a chance to show my kids that I can overcome my fears? In terms of lessons that we parents hope to give our kids, it's right up there. There was also a good chance I could finally shake my 'family chicken' title. Before I had time to second guess myself, I quickly responded to the invitation with a "Yes please, we'd love to go". Then I looked for a bucket. Over dinner that night, I announced to the family that we were going on an adventure - a treetop walk and zipline tour. Naturally, they all thought it sounded thrilling. Then my younger asked, "Hang on, are you doing it too?" A confused look crept across his face. "Yep," I proudly replied. Their jaws dropped. As did my stomach. There was no turning back now. 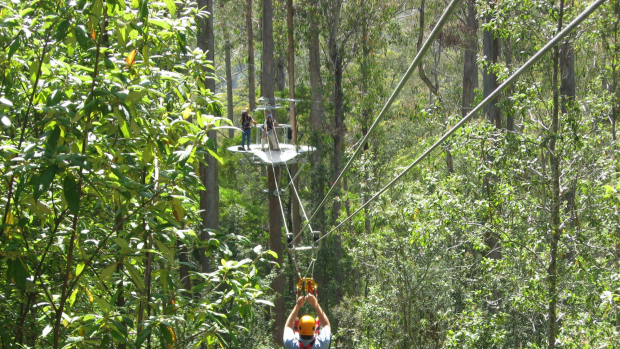 The day of the tour arrived and we eased ourselves into the adventures with the Treetop Walk Experience. 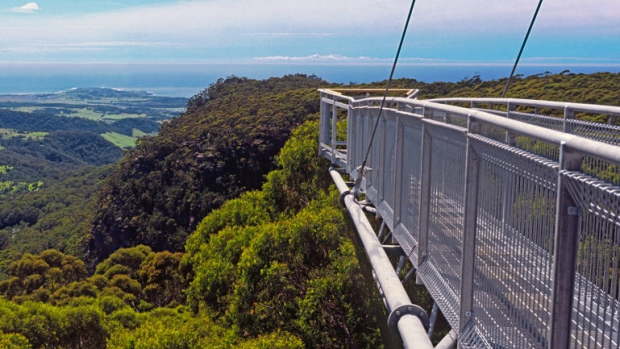 It was incredible to cruise above the trees along a 1.5km steel walkway. The path is completely safe but it's high. Really high. So I made a point of not looking down, and instead took in the breathtaking views of the surrounding mountains, bushland and Pacific Ocean. Next was the main event - the zipline tour. We were given a safety demonstration and carefully strapped into our harnesses. All 10 safety points were checked, but of course my anxiety told me they had only checked nine (I was wrong). In our group was a tiny five-year-old boy who excitedly got geared up. He looked so confident and I wished I had the same blissful naivety as him. We made our way to the start of the tour and walked up the stairs to the take-off platform. After a short wait, it was time to go. My husband zoomed off first, followed by both of my fearless children. Then it was my turn. I nervously pushed off and found myself zipping through the trees. It was terrifying for a split seconds then it was absolutely exhilarating. Weee-heee! I'd had my first shot of adrenaline and I was hooked. As I reached the end, I jumped onto the landing mat and my legs were jelly. I stumbled as I landed but I pulled myself up to safety. And of course, I was never going to fall. I was strapped in at 10 different points. The next stage involved walking across a suspension bridge. It was like something from a kids' fantasy film and I swear there may have been a troll down below. I had no choice but to look down to watch my steps and I caught a glimpse of huge drop. Gulp! It was a shaky, sweaty task but I got to other side unscathed and more than a bit chuffed with myself. The next zipline was the longest in the tour and again, after a nervous start, I soon found myself flying through the air and, gasp, loving it! Next was the third and final zipline. The instructor told us to really let go on this one. Literally. He said we could flap our arms and even go upside-down if we wanted. Of course my husband went upside-down and hands-free. My kids let their arms loose and I stood by watching them through the gaps in my hands over my eyes. Then it was my turn and I took off firmly gripping onto the straps. But then I realised, this was my last chance to really show how far I've come, so I let go and started flapping my arms madly like bird. I felt so free and brave (and slightly ridiculous) but the look of pride on my family's faces as I landed was more than worth it. And the best bit? Not only was I no longer the 'family chicken' but this mother hen had shown her kids that fears, just like eggs, can be beaten.